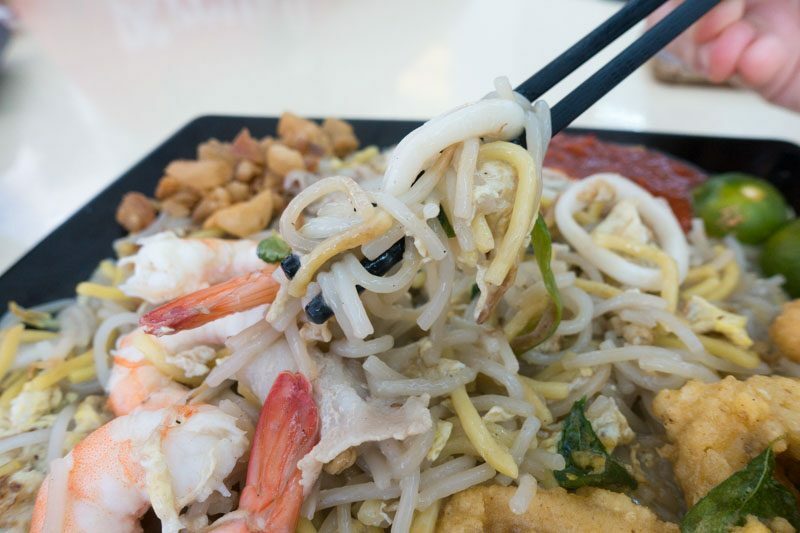 While most hawker stalls sell multiple dishes, Mian Wang 1971 only has six dishes on its menu, five of which feature its signature Hokkien mee. Tucked away in a tiny HDB coffeeshop at Bukit Batok, Mian Wang 1971 has been cooking up a storm since 1971. That’s 48 solid years of cooking Hokkien mee, can you imagine that? 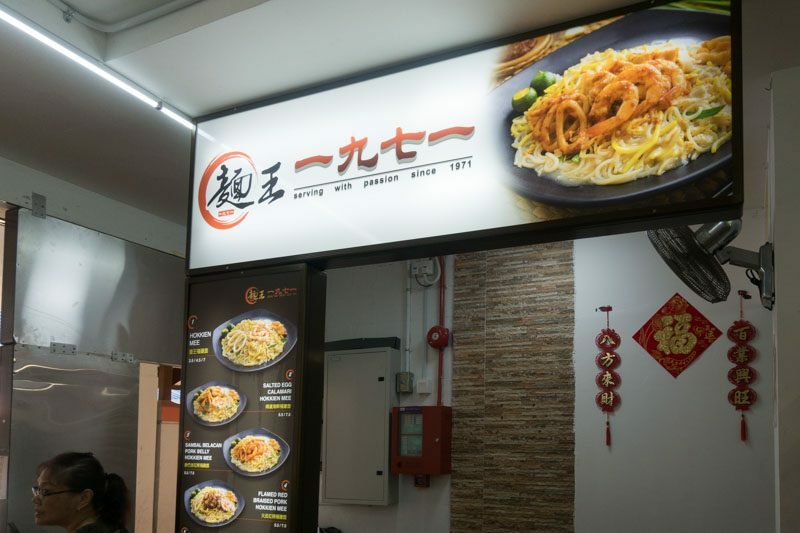 Located within Sin Eating House at 537 Bukit Batok Street 52, Mian Wang 1971’s storefront is inconspicuous and simple. In fact, I had a little trouble finding it because it was hidden at the corner of the coffee shop, right behind a pillar. Seats and ambience wise, it’s pretty nondescript with tables available across the coffee shop, and the majority of them being outdoors. When we visited the coffee shop, it was during lunch hour with sweltering afternoon heat. There were only a handful of rotating fans, so even though I sitting outside, I was still sweating! So fair warning: bring plenty of tissue or be sure to quickly chope a seat near a fan. The first thing I ordered was the Salted Egg Calamari Hokkien Mee (S$5.50). 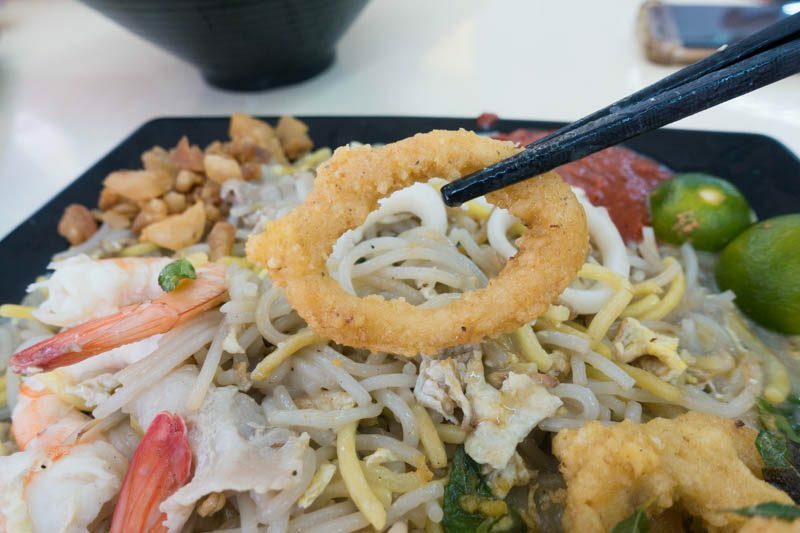 I was definitely intrigued by the unique pairing of savoury hokkien mee with crispy salted egg calamari, and I wanted to find out if the pairing of flavours worked. The calamari rings were coated in a thin layer of salted egg batter and fried till a gorgeous golden-brown. Taste-wise, it had that characteristic sharp and cheese-like salted egg taste, with a rich buttery flavour and a lingering spicy aftertaste from the chilli padi. My dining companions weren’t huge fans of salted egg in general, but they liked Mian Wang 1971’s salted egg calamari because of how aromatic and indulgent it was. The Hokkien mee was definitely the star of the show. 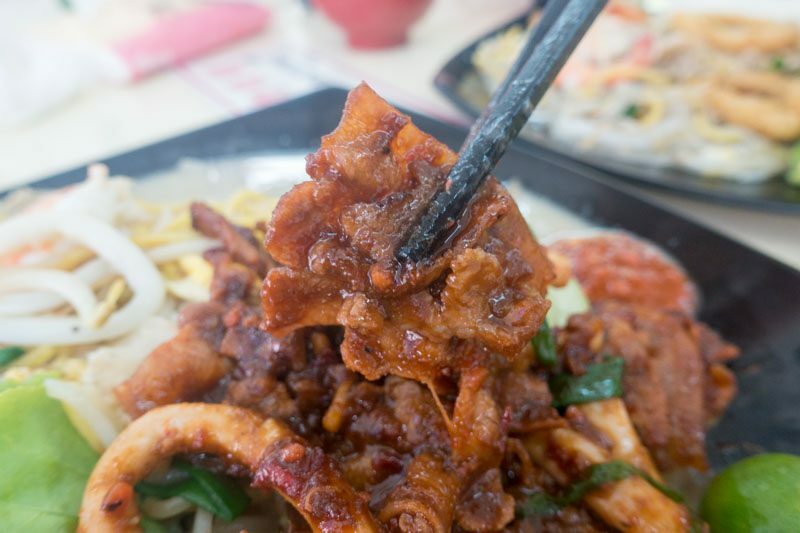 The noodles were springy and firm, and drenched in a thick gravy with a strong wok hei taste, which made each bite absolutely slurp-worthy. I loved that they were generous with the portions and there was just the right noodle-to-gravy ratio, so the noodles weren’t too wet or dry. Oddly enough, the combination of salted egg and Hokkien mee worked. The gravy was smoky and savoury, with just a tinge of sweetness, and the salted egg provided the crunch, saltiness and heat. Tip: don’t mix the calamari into the noodles as it’ll get soggy quickly. 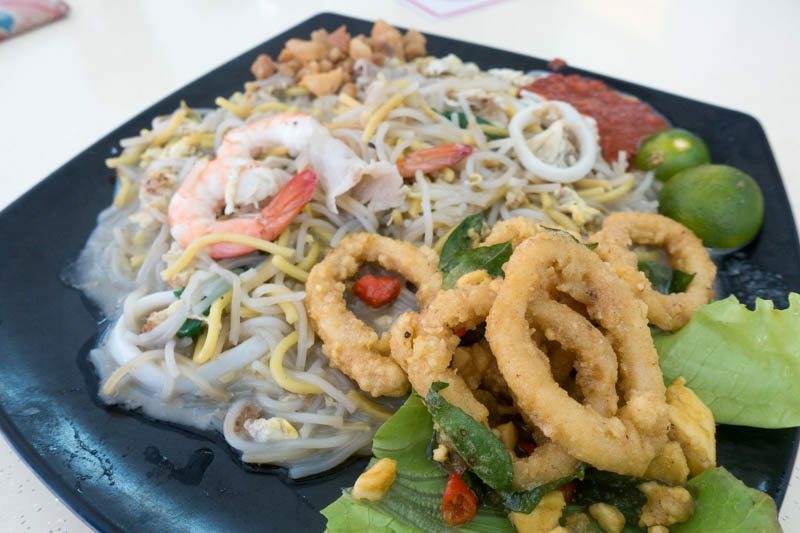 Instead, leave the calamari at the side and alternate a bite of calamari with every spoonful of fragrant Hokkien mee. 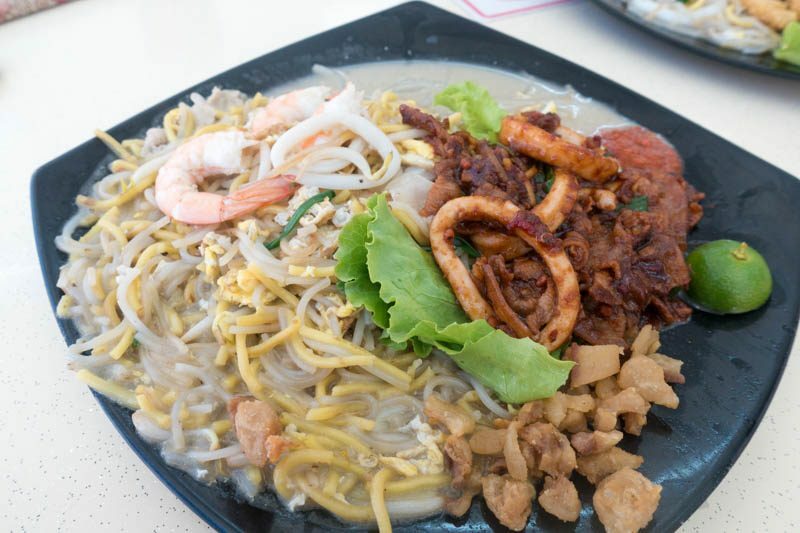 We also ordered Mian Wang 1971’s second most popular dish, Sambal Belacan Pork Belly Hokkien Mee (S$5.50). While the Hokkien mee that came with this dish was the same, what caught my eye was the glorious pile of fiery pork belly. Just looking at its beautifully charred colour, I can tell that it had been tossed in the wok for a fair bit of time. The sambal belacan used is home-made, with plenty of dark sauce, chilli and pepper. Hands down, the sambal belacan pork belly was my absolute favourite. The sambal belacan sauce had a nutty smokiness and a pleasantly tangy and sweet aftertaste. The smokiness was so strong that the pork belly almost tasted like it was charred or burnt. The umami smoky flavour was incorporated right into the meat itself, which meant that the pork belly had been marinated in the sauce prior to being fried. It wasn’t just a separate pre-made sauce that had been glazed over the pork belly. While I wouldn’t pair sambal belacan pork belly with Hokkien mee because of the strong smoky charred flavours, I would gladly eat this pork belly with a bowl of white rice. Mian Wang 1971’s KL Savoury Hokkien Mee (S$4) definitely piqued my interest because I know how uniquely different Hokkien mee in Kuala Lumpur is from our local version. The KL version is cooked in a dark and fragrant sauce and the noodles used are flatter. 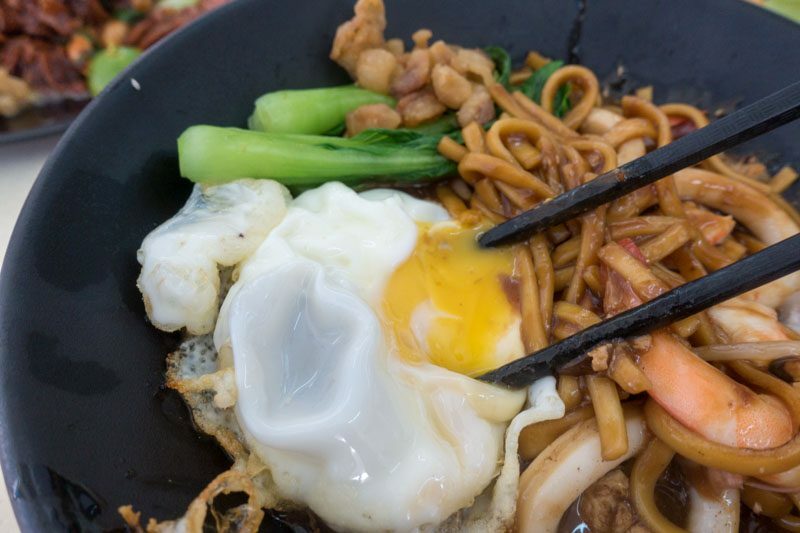 The bowl of noodles came with a perfectly cooked runny egg, which I quickly mixed into the dark-coloured Hokkien mee. The runny egg coated the noodles, which makes for a silkier and slurp-worthy texture. While the noodles were chewy with a nice bite, the dark sauce was more sweet than savoury. There was also a slight charred taste to the noodles, just like the taste of burnt rice you’d scrape off the bottom of a claypot. The charred aftertaste definitely made the noodles more aromatic. However, I wasn’t a huge fan of the overly sweet gravy. Though if you’re one for sweeter noodles, then this would be right up your alley. For the price, Mian Wang 1971’s large portions don’t disappoint. 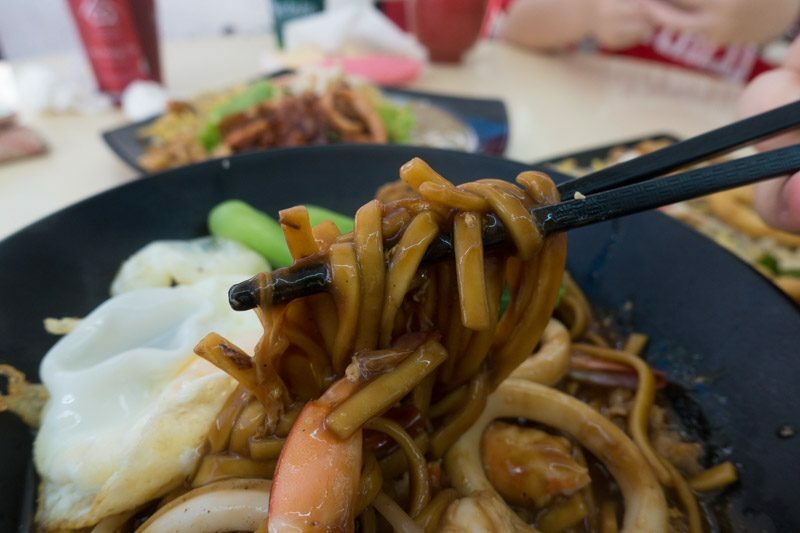 I love the Hokkien mee because it was drenched in thick gravy with a strong wok hei taste. The generous portions of seafood and pork belly, and firm and springy noodles were big plus points too. The sambal belacan pork belly Hokkien mee was one of my personal favourites. My dining companions actually preferred the salted egg calamari Hokkien mee, which was unique and different. It’s not something I would travel for, considering I stay in the East. But the next time I’m in the area and craving some hearty and fragrant Hokkien mee, I’m definitely stopping by Mian Wang 1971.